Custom printed soccer jerseys aren’t what they used to be. Today many teams, especially youth and indoor are substituting the traditional jersey for a moisture wicking performance poly tee. In fact even the major brands are offering several styles in the moisture wicking tee. The nice thing about these are that they are very cost effective which is great when you are talking about a kick around indoor league or kids who will outgrow the jerseys by next season. Typically 12-16 custom printed soccer jerseys with a 1 color logo on the front with a name and number on the back will run around $15-$18 per jersey. It just depends on the particulars of shirt style, color, and whether it’s standard lettering. This is pretty much the going rate from Kirkwood Trading Company. 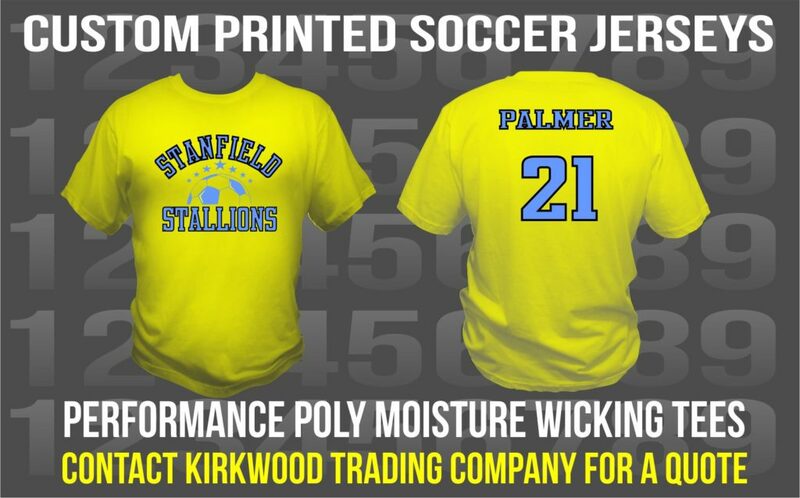 We print a ton of jerseys for many different kinds of teams each year from youth soccer to adult indoor fun leagues. The quality of the jersey is key especially if you are talking indoor. The best fitting and comfortable tees are the polyester tees with the moisture wicking properties which are also light weight. Gone are the days of the thick cotton shirts that just hold the moisture in. When it comes to custom printed soccer jerseys we can also assist in logo design. We’ll be happy to show you different font options for the names and numbers and even the various options for the texture of the lettering and numbering. In addition to jerseys we carry soccer socks and shorts as well as bags. We can cater an entire uniform for your needs and even provide the spirit wear. If you are in the market for custom printed soccer jersesy check out our selection. All of our printing, lettering and numbering are done in-house which saves you time and money. A typical turn around will be 4-6 business days on soccer jersey orders.